President George W. Bush told NASA to return to the moon and prepare for manned exploration of Mars. President George W. Bush told NASA to return to the moon and prepare for manned exploration of Mars. The man he put in charge, Michael Griffin, was a certified rocket scientist with a passion for manned space exploration. In the four years he served as NASA Administrator, Griffin was continually forced to make controversial financial tradeoffs that brought him into conflict with constituencies who disagreed with him. 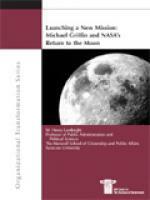 He did, however, make significant progress in redirecting NASA toward the new Moon-Mars program. This report provides insights into the challenge of managing large, controversial programs in government. It also offers lessons for both the next NASA Administrator as well as other public executives who are expected to lead in challenging political and fiscal environments.